I have liked Hopper’s “Nighthawks” since I first saw it. It’s one of the more famous pieces of American art, so I thought I would take a close look at it this week. If you’d like to do the same from the comfort of your own home, you can always order a custom mat to really make it pop. This painting has had an undeniable influence on pop culture, with homages showing up in everything from Terrence Malick’s movies to Tom Waits’ Music. Nighthawks is a dark piece in more ways than one. While not grim in the ways of some other pieces, it does show a group of lonely people. Setting the painting at night, with lots of shadow, furthers this idea of isolation. The fact that it is also a rather mundane scene- just people sitting around- make the scene more melalcholy than tragic. You don’t get the feeling that anything bad happened to these people, they’re just unhappy. 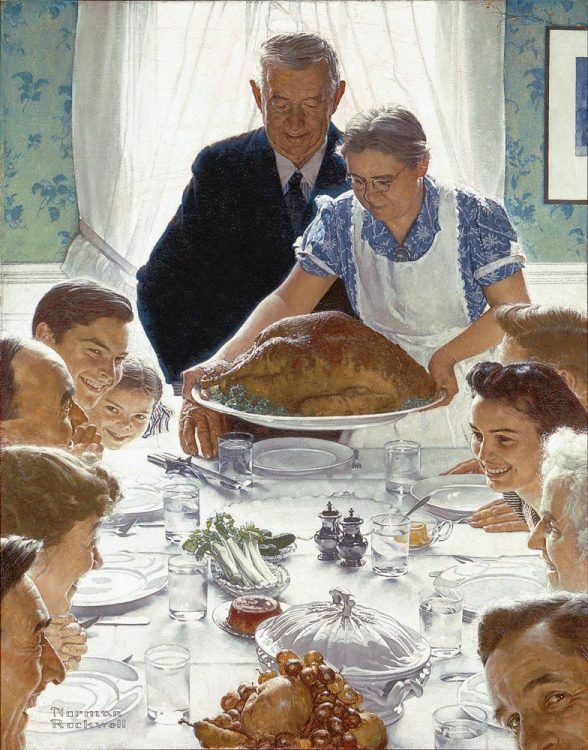 To offer a bit of contrast, look at contemporary Norman Rockwell’s painting “Freedom from Want,” which shows a much happier scene. Hopper apparently did not like any comparisons to Rockwell so I won’t linger on it. I merely want to show that the two men, painting at the same time, captured two very different side of America that both feel authentic, even if they are at odds. Of course, like American Gothic, the best way to know if you’ve made it is the number of parodies available. 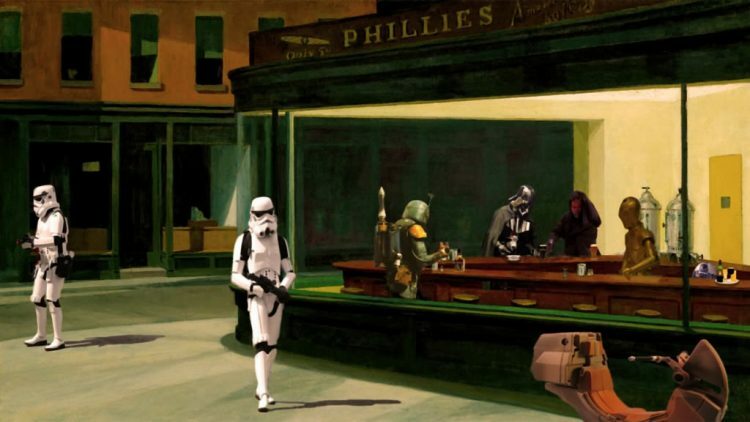 By this standard, Nighthawks has made it. In addition to the more serious homages like the ones mentioned above, many people have had a little fun with the painting as well. Silly as it is, though the dark painting doesn’t feel entirely out of place in the rough universe of Star Wars. And finally, just because I like this, parody that shows an anteater throwing a chair at the famous diner. This one has always made me laugh, though I couldn’t tell you what exactly I find so funny about it. If you really want to make your living room pop, you could order a multi opening mat with all three of these!